Similar in style to the Jaipur Jumper, this Tunic has an asymetrical neckline and lower edge finished with beaded detail. Here it is made in pure silk but can also be made in Linen/Cotton. 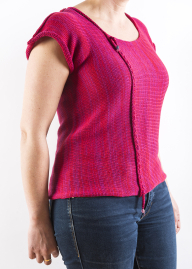 Available in different lengths - Crop, Hip and Long : the later has a straight bottom edge. 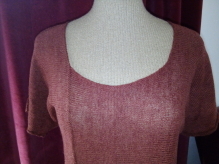 Available in Pure Cotton with self or contrast Weave. Different lengths and sizes available. 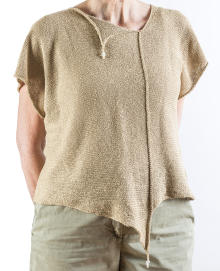 A simple, round neck tunic with asymetric seam detail in Linen/Cotton or Silk. Another colour can be seen far left under the 2 layered Coils.